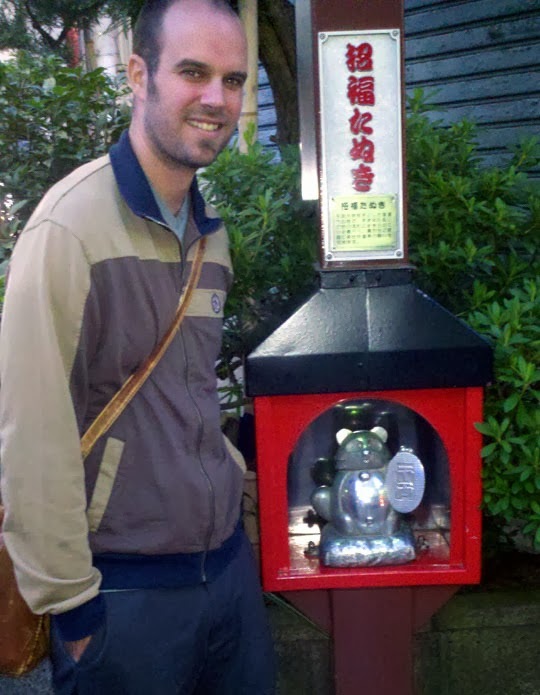 Partway through our time in Tokyo, we discovered the Tanuki. 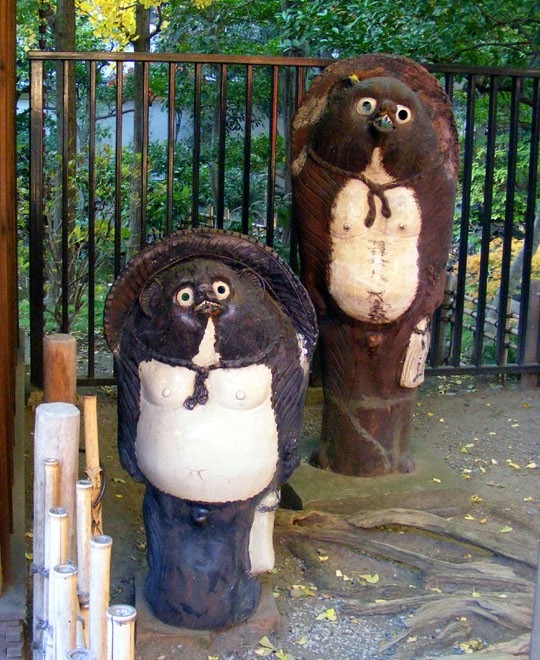 Tanukis are Japanese raccoon dogs that are a real animal and also a folk god. We never saw the real animal but we saw plenty of the folk god. 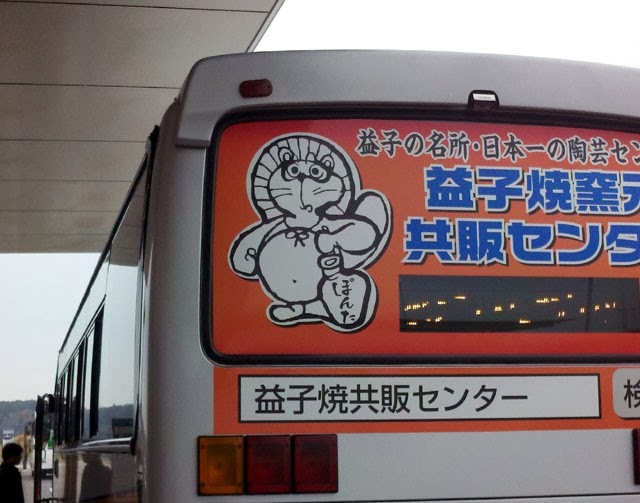 You can recognize him by his signature straw hat, promissory note, bottle of sake and giant testicles (seriously). 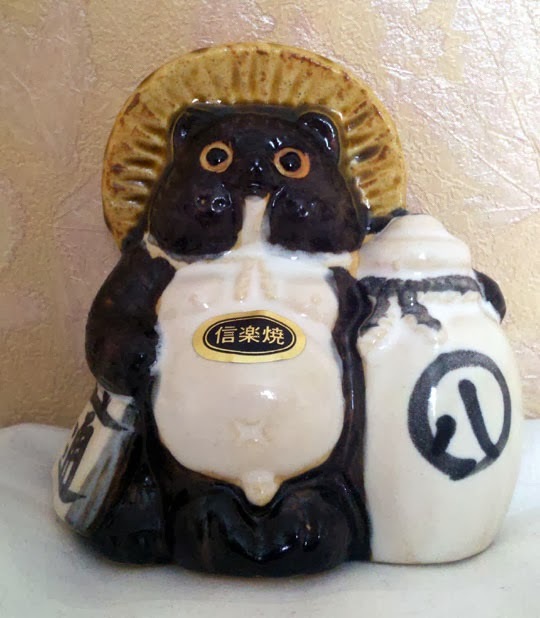 He is a sign of good luck and prosperity that stores will display outside, and there is even temple devoted to the Tanuki. Tanuki at a Tanuki temple. There's a whole street named for them in Tokyo where these shrines line the street. Tanuki are also popular in selling commercial products (and yes, Mario's Raccoon suit in Mario Bros, is actually a Tanuki suit in Japan). 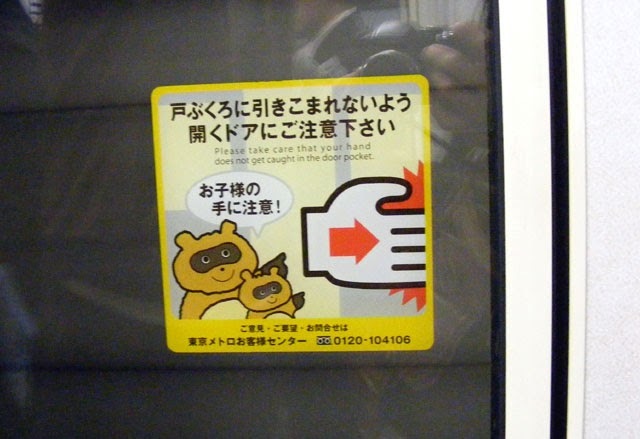 There are even Tanuki who will laugh at you if you get your hand caught in the Tokyo subway door. We couldn't leave Japan without a Tanuki of our own, so, after much searching, we bought this little guy. Those aren't feet between his bottle of sake and promissory note. 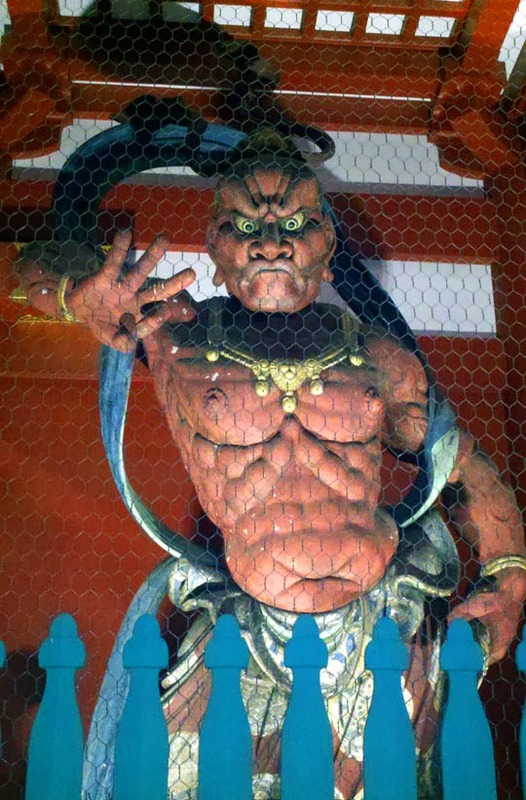 Not all statues in Tokyo were quite as cute and cuddly - or well-endowed - as a Tanuki. This guy was standing guard outside a Buddhist temple. The Japanese seemed to be all about Christmas. 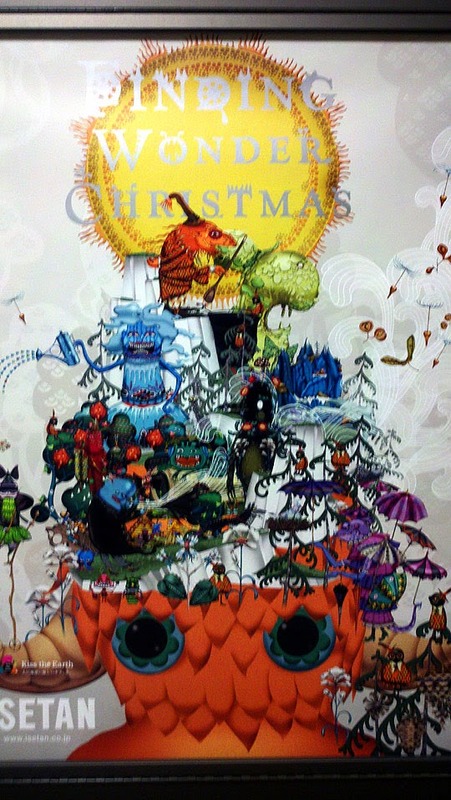 We were there in mid-November and whole city was done up in Christmas decorations... but Christmas in Tokyo can be a psychedelic journey as you can see from this mall's Christmas decorations. 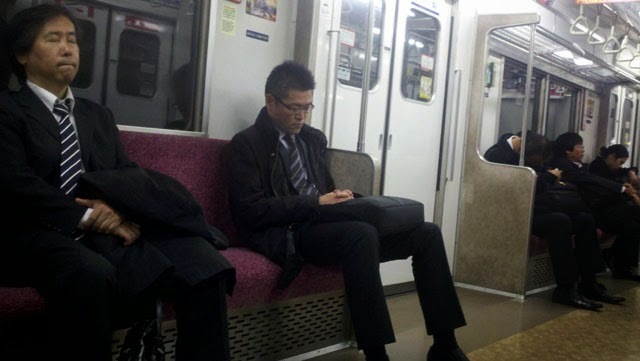 Five people, all asleep, and this was just a random train at maybe 4 pm. One part of Tokyo we really liked was that there were toilets everywhere. Out in public, in subways, everywhere there were toilets and they were really nice. 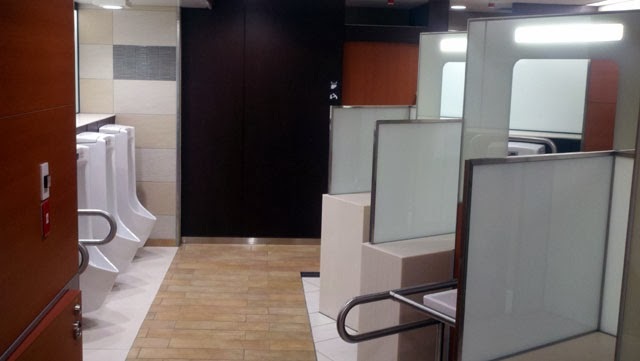 This picture is of a men's toilet in one of the busier subways in Tokyo. Fancy hotel? No, men's room in a subway station. One one of our last days in Tokyo, we heard a lot of racket going on outside from our Hotel room. 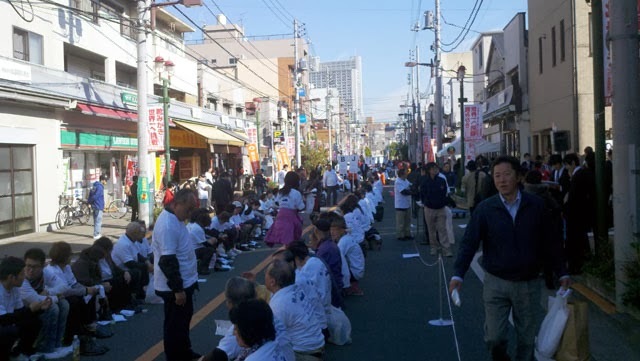 We went out to investigate and found out that the citizens of our district of Tokyo were setting the official Guinness Record for the most people shining their shoes at once. We thought of joining them, but Andrew only had flip flops and Maggie didn't want to ruin her new boots. Tokyo, you were crazy, but we liked you.